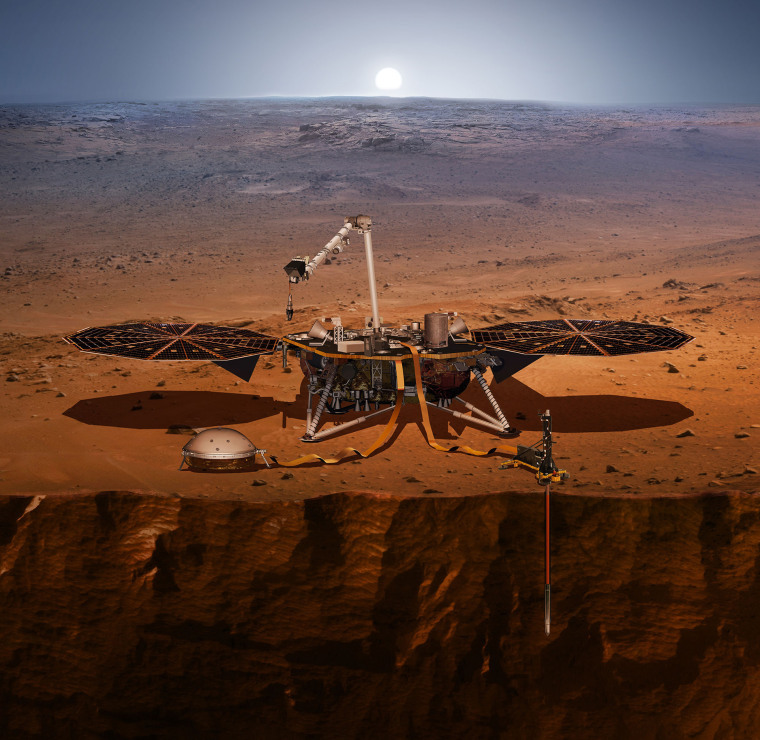 The InSight mission is scheduled to launch this spring. NASA has been sending space probes to Mars since the 1960s to study the Red Planet’s climate and geology and to look for signs of life. Now the space agency is in the final planning stages of a new mission that will be the first to peer deep below the planet’s surface. The primary goal of the InSight mission — now scheduled to launch from Vandenberg Air Force Base in central California between May 5 and June 8 — is to give scientists a better understanding of how a once lush Mars evolved into the dusty and seemingly barren planet that we see today. Unlike Curiosity and other rovers that have operated on Mars, the 800-pound InSight lander won’t be able to move about on the planet’s surface. But it has a suite of instruments that includes a seismometer and a heat probe — and a seven-foot-long robotic arm to help operate them. The lander will use its instruments to observe the frequency and magnitude of marsquakes and measure how heat moves deep within the planet and to the surface. “Think of InSight as Mars’ first health checkup in more than 4.5 billion years,” the mission's principal investigator, Dr. Bruce Banerdt, said in a written statement. InSight isn’t designed to search for life, but McMahon said understanding what’s happening beneath the Martian surface may reveal clues about whether microbes could thrive on the Red Planet. “The warmer the Martian interior, the nearer the surface liquid water could be stable — good news for finding extant life,” he said. No matter when InSight launches, the lander is scheduled to touch down on Mars on Nov. 26, 2018, after a journey of 301 million miles. It’s expected to remain active on the Red Planet for two years.